The Java fried rice recipe is simple enough to make. 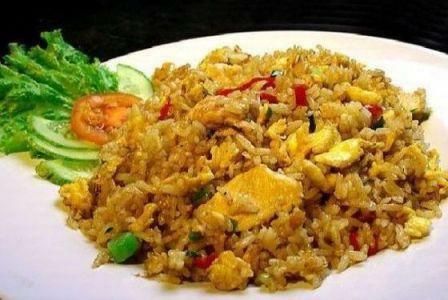 The procedure for making java fried rice will make you get a pleasure in meals or breakfast. This dish is very delicious and can be cooked quickly and easily. For lovers of spicy, you can arrange how much chili you want to use. Use red chili pepper to make the fried rice spicier. It is ideal for breakfast, go to the office or work in the factory. The value of that food is high due to the presence of eggs, beef and shrimp (if you have). Java fried rice is different with other fried rice especially compared with Hong Kong fried rice. Java fried rice is simple to cook but it has delicious taste that suit to Javanese taste. The following java fried recipes is recommended for you. Here are some ingredients that you should prepare first. First of all sauté all ingredients until fragrant. Then give three tablespoons of sweet ketchup, and stir it until smooth. Put the meat and shrimp and stir again for a few minutes. Then add the rice and stir constantly over low heat until all ingredients blended and lift. In the serving of java fried rice, usually it is included a sprinkling of crispy fried onions, fried eggs, slices of cucumber, and shrimp crackers. This food will be more delicious when this dish is eaten while it still warm. We will taste delicious taste, and we will certainly more devour in eating eat. Therefore we can keep the quality of the breakfast, and certainly will give us more power to go to the office or school. That’s all about java fried rice. It is simple recipes that you can try in your home. It is only need a few times to make it.